Learn how Microsoft is continually taking steps to maintain your trust in Office 365. Why would you choose Project Online? Let’s assume you’ve made the decision to improve how you manage and approach portfolio / programme / project management (which is a topic in itself). As an organisation you’re spending time reviewing your processes and working practices, in light of your requirements and aspirations. Now you’re looking for some tools to help support these changes. I will be looking at the various capabilities over the coming days and weeks. In the meantime, using Project Online and working with a suitably qualified Microsoft Partner, can help you deploy the toolset in a shorter timeframe. This can seriously reduce upfront CAPEX that may be required to get an environment up and running (licenses, virtualised or hardware infrastructure). At the same time, your partner should be able to provide an OPEX approach to deployment and on-going support, in the same way that your organisation is obtaining Project Online. If you have already have a copy of Project Professional 2013 installed, the Project Online license allows you to save your project schedules to Project Online and use all the web capabilities. 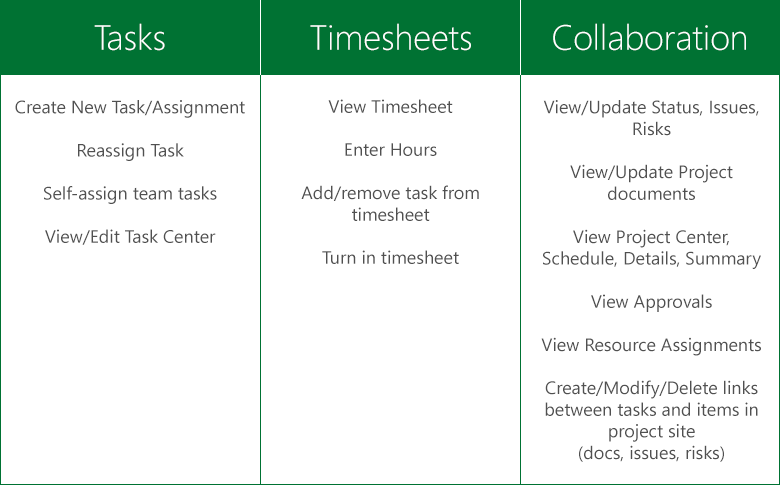 Project Online with Project Pro for Office 365 – Full web based PPM capabilities, the equivalent of Project Web App, plus Microsoft Project Professional 2013 streamed (installed) to your desktop. Project Lite – a reduced set of web based capabilities, ideal for team members, and again the equivalent of using Project Web App. Project Pro for Office365 – Microsoft Project Professional 2013 streamed (installed) to your desktop with a subscription to Office 365. No Project Online capabilities, the equivalent of Project Web App. At Project Conference 2014 Microsoft announced that a new license would be made available for Project Online. Project Lite enables project team members to edit and submit timesheets, collaborate on project related documents, update tasks, log issues and much more – all at a price point of £4.60 per user/month*. What do you need for Project Online? Real world examples – what are other organisations doing?